Today, the reputation network Rapleaf is releasing a new service called Upscoop, which joins a number of startups (see ProfileLinker and Wink, for example) trying to add a meta layer above social networks. There are a lot of these networks, and a lot of people belong to more than one. Keeping track of your own networks, and those of your friends, is complicated. Upscoop is designed to help you figure out which networks your friends belong to, based on their email address. You give Upscoop your email credentials (including the password) for your AOL, Gmail, Hotmail, or Yahoo email account. Upscoop grabs your contact list, and then searches across a number of social networks and tries to find profile pages of people that you know among the 10 million profiles they’ve indexed across the major social networks. The process of searching is not instantaneous – it actually takes a few hours. Clicking on any result will (sometimes) bring you to the profile page for that person. You can then add them as a friend or otherwise interact with them. Asking people to give Upscoop their full email credentials to complete the search is going to be a tough sell. 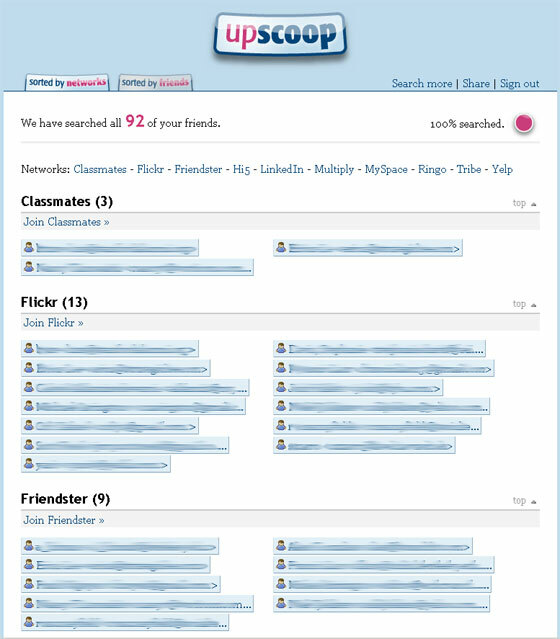 But this is a lot easier than searching for friends one-by-one on Wink. For people serious about connecting with friends, Upscoop may be for them.